Palpitations is the term describing any awareness of your heart beat. It can be a fast, slow or irregular heart beat. It may last seconds, minutes, hours or days. Palpitations are very common, and do not necessarily signify heart disease, and sometimes can even occur with a normal heart rhythm. However, Palpitations should be investigated if the symptoms are bothersome. Your Cardiologist can often determine the cause of Palpitations from the description given. If necessary, a 24-hour heart monitor (Holter Monitor) can be worn to document the heart rhythm at the time of symptoms. If no symptoms are experienced during this time frame, a 1-2 week Event Monitor can be worn. There is also a small implantable monitor which can be placed under the skin on your chest (below the clavicle) that can monitor the heart beat continuously. It can be programmed to record abnormal heart rates automatically, and it has a patient activator that can initiate a recording whenever you feel symptoms. Investigations usually include Echocardiography, to assess your heart structure and function, uncommon to exclude uncommon abnormalities in the heart that may present with palpitations. Most patients with palpitations have a structurally normal heart, then treatment is based on symptoms. Not all patients require treatment of their palpitations, if not too bothersome. In other patients, simple medication can alleviate the symptoms. 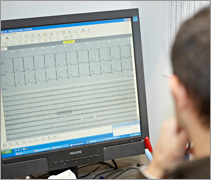 An Electrophysiologist is a Cardiologist who specialises in palpitations and arrhythmia management. We have several Electrophysiologists consulting at Melbourne Heart Care, including Dr Jeff Alison, Dr Emily Kotschet, and Dr Logan Bittinger.